THE BAY The Series Press: ABC SOAPS IN DEPTH: Gaskill Goes Dark! When Emmy nominated Web drama, THE BAY, kicks off its summer special, DARKSIDE OF THE BAY, viewers will learn that there's a whole lot more to Bay City than just rich folks and white sand beaches. 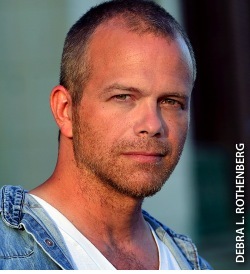 Helping to tell the edgy tale will be soap opera veteran, Brian Gaskill (Rafe, PORT CHARLES; Bobby, ALL MY CHILDREN). "The [story] is about the show's younger characters getting wrapped up in this dark world on the other side of the tracks," previews Gaskill. "Lianna (played by Jade Harlow; Jessica, PASSSIONS) gets kind of [involved] in the prostitution ring that my character, Chase, works in as a pimp. I'm not the head honcho, but I work for [him]."